second viewing. chuckled in delight at the ending this go around: for how long it took the hysterical boyfriend to comprehend, and amy steel's reaction was well done. i'd've _liked_ to experience the film as intended, to have that realization in tandem with them, except no matter how much time was put between the initial pranks and the reveal, whatever else came up, i wasn't buying any of it. has anyone actually owned up to being fooled by this ever? the idea's OK, just way too obvious to work as written here, and if you guess the twist (from the _title_ alone, say) there's not much else happening... i don't care about people or their privileged lives. what else? it is kinda fun to watch deborah foreman interact with the group when you know she's orchestrating everything. i focused on the art direction, those attractive of-the-time pastel hues/complimentary colors, the introduction of more red danger tones after skip is discovered inc. arch's & rob's shirts, kit's tie, porter's flare, nikki's robe etc. no blu yet but prime has a nice HD print for rent. > i don't care about people or their privileged lives. _these_ people. i write too fast. 1. Arch and Skip playing the knife game. Arch throws what is a (I assume plastic?) prop knife and it basically rockets in a completely straight line halfway across the ship and hits Skip directly in the stomach, manages to stick there and I guess break the squib he has hidden under his shirt. Really? 2. The "deckhand" getting his face mangled managed to do a two to three hour professional makeup application on his face in a matter of seconds WHILE UNDERWATER. Amazing! And a lot of the other "scares" relied entirely on a ridiculous amount of sheer coincidence. Good example: The corpse under the floorboards of the boathouse bit. To pull that off would not only require impeccable timing but also psychic ability. They had no clue anyone would even go in the boathouse and even less of a clue that a couple would happen to be lying on the floor in there and one would just happen to turn their head to the side so they'd even see the body. No one was lured there as Amy spontaneously pulled her boyfriend in to cheer him up. And then after they see the "body" neither even bothers trying to look *under* the boathouse or in the water to see if the corpse was still there. The more I think about all of the individual prank scenes, the dumber it seems to get! it's a disaster. the "final couple" need to act illogically to stay in the dark. otherwise, they're in on the joke just like everyone else. don't immediately flee the boathouse, stick around ten seconds and you'll see skip isn't dead! truly, the scheme would've fallen apart at the first hurdle. and nan looking non-plussed during the ending celebration to set up the (already neutered) last scare... nothing works. Not to mention the whole set-up is about Muffy doing a test run to turn the place into a murder mystery bed-and-breakfast type establishment to save her inheritance. Seeing how her first attempt includes one guy almost getting injured (perhaps killed) by a snake, one woman driven to hysteria because she's reminded of a past trauma AND someone bringing a gun that very well could have been whipped out and used against HER or anyone else at any point, you would think she's realize her idea is terrible. Well, unless she wants to get sued or end up in prison. And yet she acts like she's ready to go afterward! Ha! I read that the ending was changed three times. They filmed two different endings in Canada, one where Skip (really) tries to kill Muffy for the inheritance and another prank they all orchestrate to get back at Muffy. The ending with Nan scaring her was filmed 3 or 4 months later in L.A. and tacked on instead. 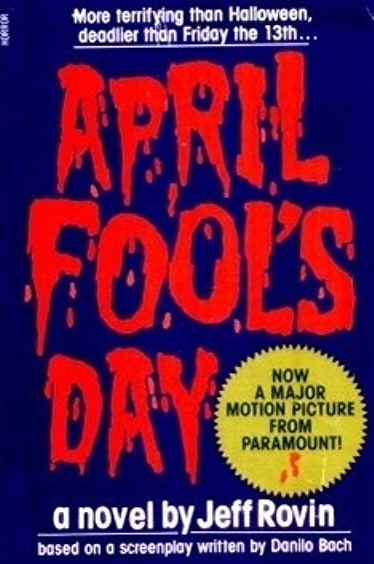 FANGO's piece on APRIL FOOL'S DAY doesn't give up anything interesting. fred walton (misnamed "frank" on the contents page) talks a bit about shooting the snake scene, how he got the job, and WHEN A STRANGER CALLS. Lord, I hope Fango wasn't actually *praising* the film back then. I actually wondered how the genre specific magazines reacted to this when it was released. I got a little annoyed reading some 30th Anniversary articles about this movie after I did my review. One on Daily Dead (https://dailydead.com/april-fools-day/) claims it "largely flew under the radar." This was a wide theatrical release from a major studio that was in EVERY video store in the U.S. and all over cable for decades. 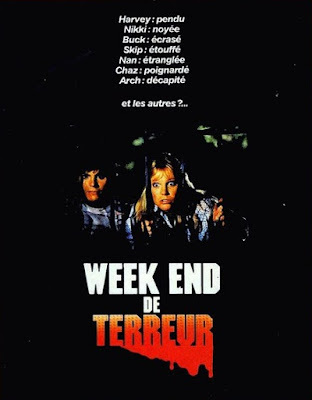 It was pushed and promoted very hard with a higher budget than even the Friday series got. As for revisionist write-ups decades later behaving as if this was some kind of underdog production: No way! I don't think you could have avoided this film if you tried. But the same Daily Dead article also has a Walton interview that explains a lot. 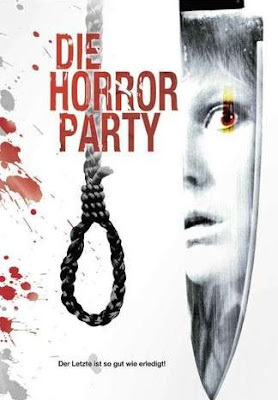 He claims it was conceived as a parody but he didn't love the script and simply tried to make it scary without any gore. That probably explains why it's not really a parody despite the PR people referring to it as such. Bonfire sequence? Why do I not remember that? > The more I think about all of the individual prank scenes, the dumber it seems to get! the one that gets me is the well scene. maybe nikki wouldn't have fallen and cracked her skull open because they loosened the rungs (hilarious joke, guys!) but the staging of it, with the bodies and decapitated heads undetected for several minutes before emerging from the water... no! > I hope Fango wasn't actually *praising* the film back then. i'll try to dig up any mentions subsequent to the promo. there's probably a review or at least a note of the video release a little later. they didn't cover I SAW WHAT YOU DID! or the STRANGER CALLS sequel, AFAICS, but they did get walton back for a WASC retrospective (september '95). 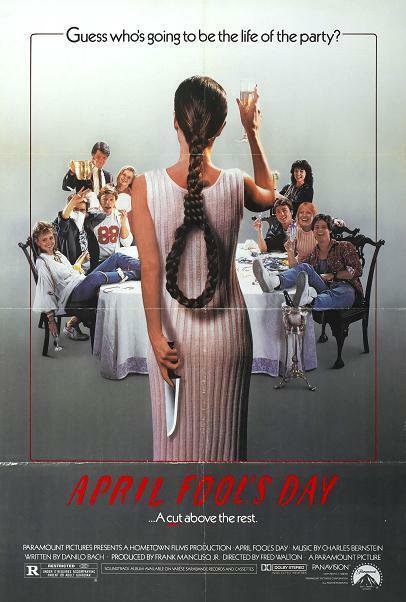 in that, writer keith bearden calls APRIL FOOL'S DAY an "underrated horror/comedy". looked up AFD in john mccarty's OFFICIAL SPLATTER MOVIE GUIDE (it happened to be within arm's reach) immediately after this recent viewing. he says: "cleverly directed and well (and amusingly) acted by it's youthful ensemble cast, AFD definitely isn't great, but it does have its moments." book published in 1989.
you know, i actually like them both in that scene and how it plays out, even if it doesn't work as a scare. just too little, way too late. > Bonfire sequence? Why do I not remember that? I think it was Roger Ebert who called it "The Idiot Plot" where if people behaved like normal human beings the movie would be over in about 5 minutes. I think it's safe to say that if anyone behaved like a normal human being in AFD the end credits would be rolling right after the boat docks at the beginning! And then it adds insult to injury by removing all of the exploitative elements that really fueled 80s slasher flicks so it doesn't successfully parody them either. Not very well thought out at all. Based on his comments, I don't think Walton was ever really on board with the "comedy" and directed accordingly. 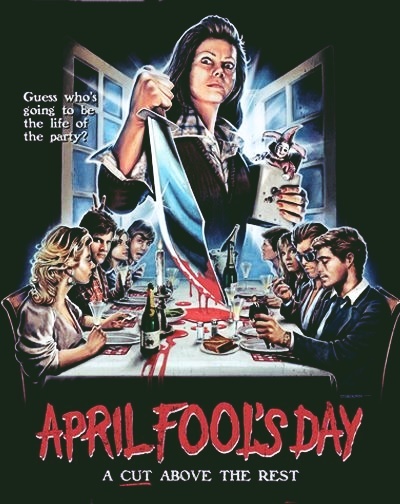 A lot of people always knock Jim Wynorski, but Sorority House Massacre II and Hard to Die are far better parodies of slasher-exploitation but will never be given credit for it. I'm utterly perplexed at all of the reviews calling the characters likable. I hated nearly all of them even though the actors themselves were good. I think my favorite was Goodrich, who has that rare ability to deliver lots of sarcastic dialogue yet not come off as being too bitchy. I'd probably rather be friends with her than Amy Steel's character, who didn't get me in her corner after humiliating her boyfriend during dinner, even though I think she apologized for it later. I didn't mind the last scene so much either. 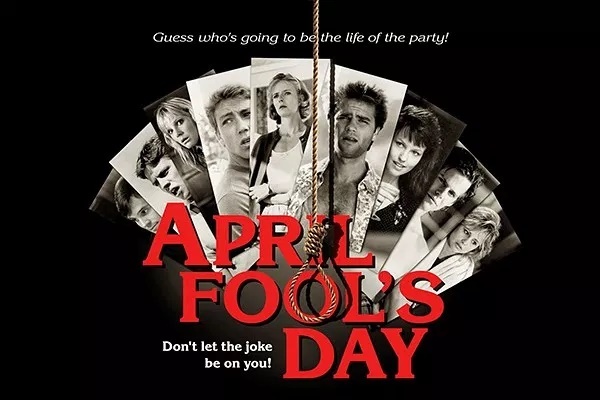 It's basically the only murder prank in the entire film that could plausibly be pulled off! But, yeah, too late!